I never imagined how breathtaking this would look in my mind’s eye. 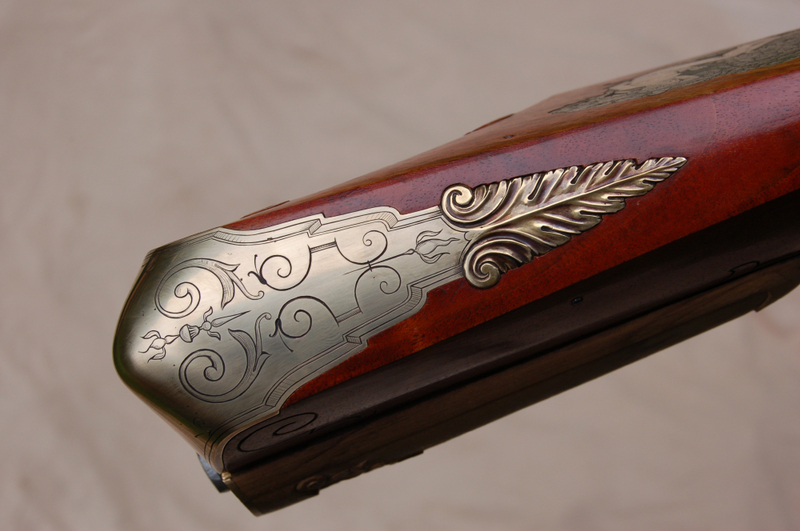 I’d seen original guns with this technique of gold inlaid into steel, I’ve seen pictures a-plenty of original and contemporary works, but to see this transformation taking place before my very eyes, I am at a loss to describe my feelings. oh, my, oh, my, I am at a loss for words. I know I made this hapen, I know I inlaid the gold, cut all the lines, undercut all the lines, conceived the artwork, drew and drew and dreamed and planned for hours on end, but all of that did little to prepare me for this transformation of the bright steel to blue, and the contrast with the gold. Oh, my. Something extraordinary happened. Beyond my scope of understanding; yet, there it is. There is the object of my dreams, appearing before me, and the shock is beyond belief. It is like I do not recognize my own child. I must also give thanks to those who have helped me along the way. 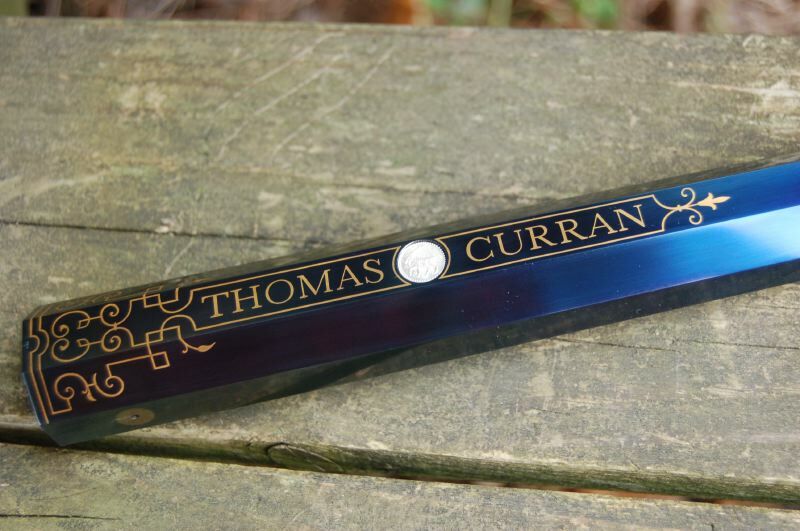 One such person, Jerry Huddleston, contacted me several years ago and said “Tom, you really need to learn how to engrave properly.” Jerry offered to teach me the basics of sharpening and engraving, plus some precious metal inlay. As important as the lessons were from Jerry, the most valuable lesson I learned was: Jerry saw something in me that I did not really see in myself. He believed enough in me to teach me what took him a lifetime to learn. The breech section, a close up view. This is the muzzle, repolished and re-blued. I am in the process of coloring the barrel. 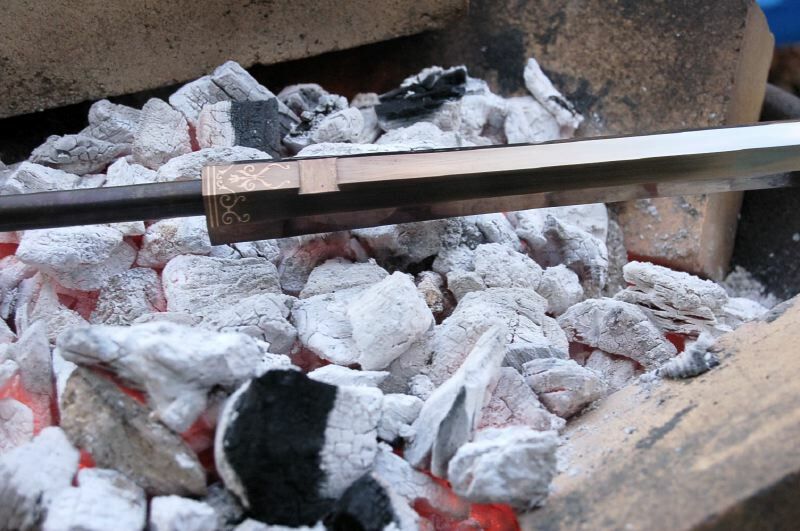 I heat this over a charcoal fire in order to get the temperature high enough to turn the steel a blue. 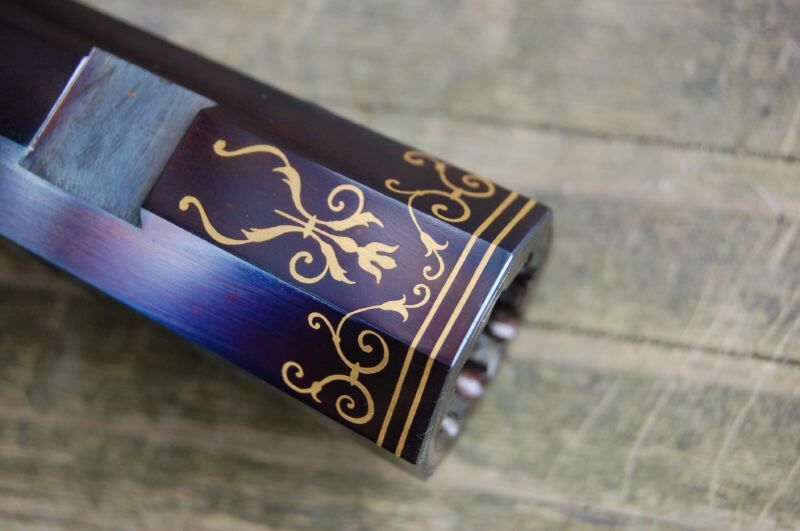 As I bring the heat up, the barrel changes from a straw brown, to a darker shade, then tinged with a deep purple blue, switching over entirely to blue. More heat, and the steel goes to a pale blue, and then gray. These colors are separated by only a few degrees of temperature. I found I had to keep an eagle eye on the barrel, moving it constantly, to avoid hot spots and sudden color changes. Yikes. 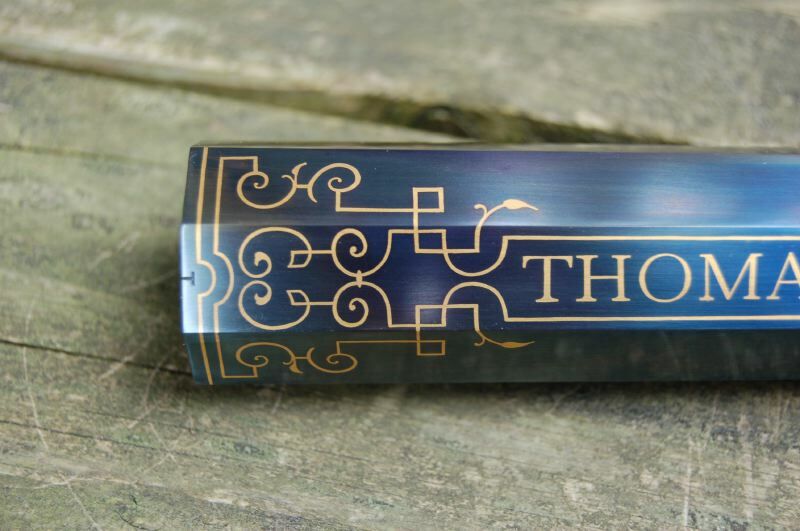 After a couple of months of engraving and inlaying gold, you can imagine I’d be nervous about messing up all that work. In the photo below, you can just see the barrel starting to turn from the brownish to purple. The charcoal is “Cowboy” charcoal, made from wood chunks. The briquette style might have impurities that could affect the workpiece, so I played it safe with the real wood charcoal. 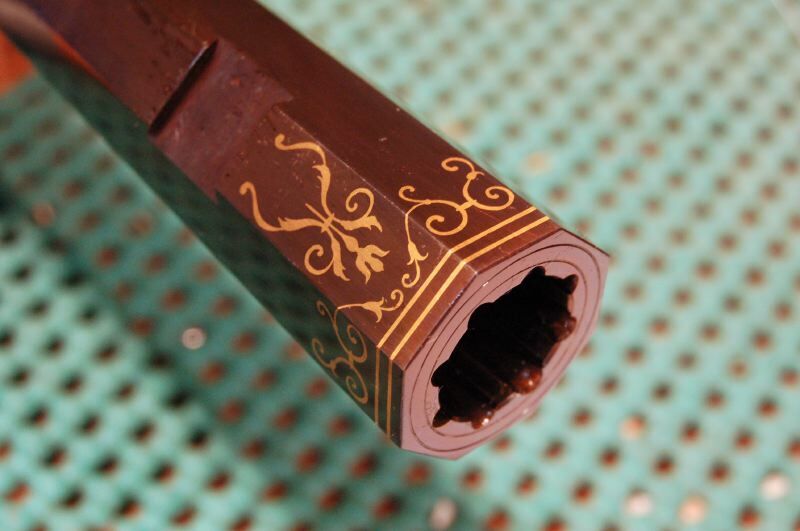 Below is a picture of the muzzle end of the barrel, with the gold and the darkened steel. I found some ick on the barrel, possibly from the cloth I was wiping the hot barrel with. So, I will polish this up bright again, and put it back in the fire. I’m disappointed that it got a little screwed up, but nothing that a little elbow grease and time can’t fix. I’ll post more pictures when I get it done. 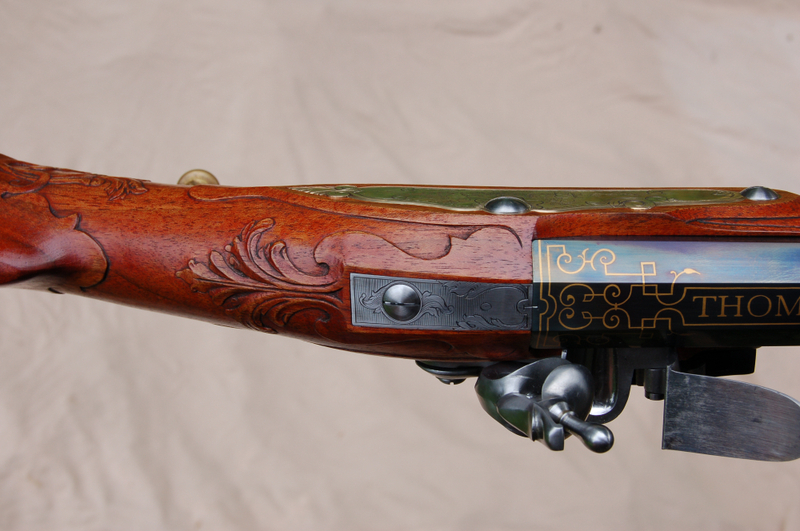 Building the rifle is one thing, but decorating the gun an entirely different proposition. 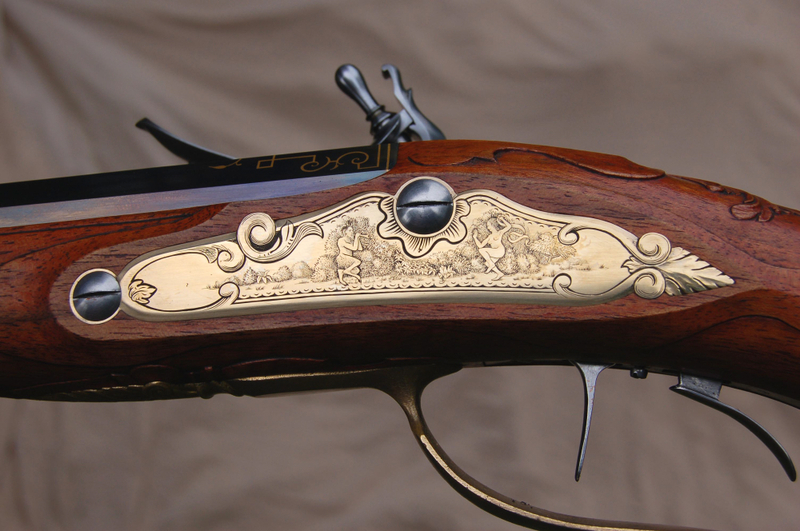 It is in the carving, chiseling and engraving that the gun comes to life as an artwork. 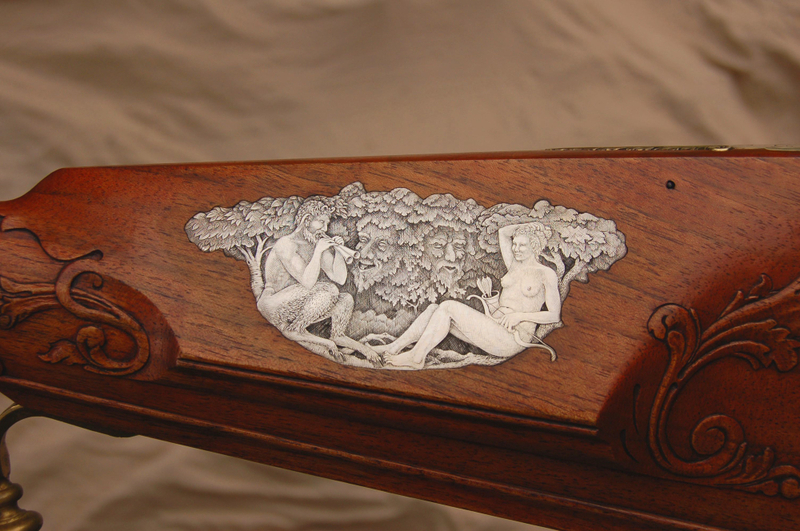 The theme I have chosen for this gun is about Pan, a Faun, and Diana, the goddess of the hunt. 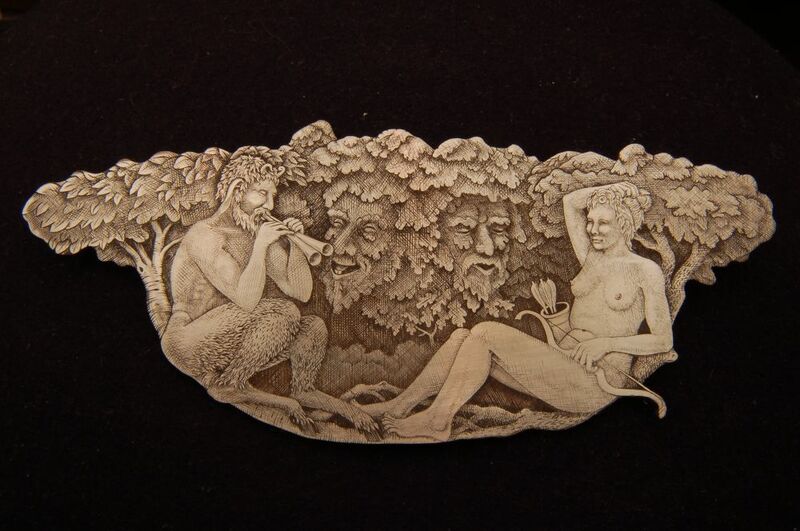 This is loosely based on the classic Greek and Roman stories, ancient and modern sculpture and painting. 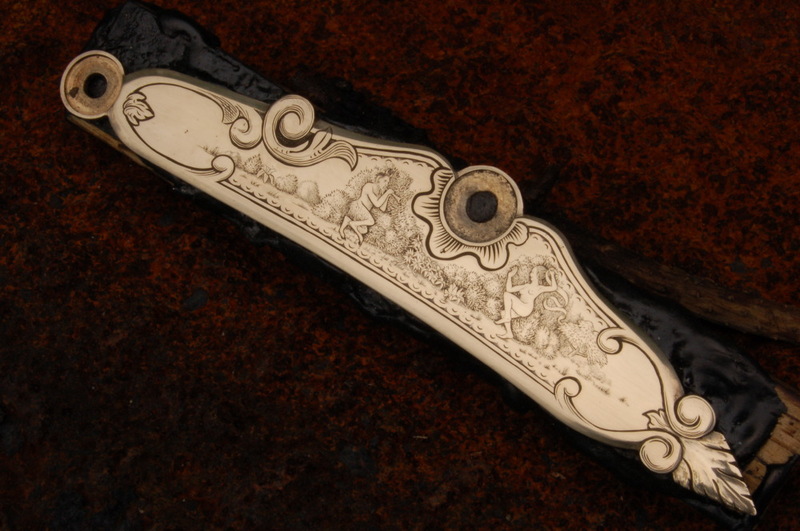 This theme of the faun Pan and the goddess Diana will be threaded through this rifle, engraved on different pieces of the gun’s hardware. 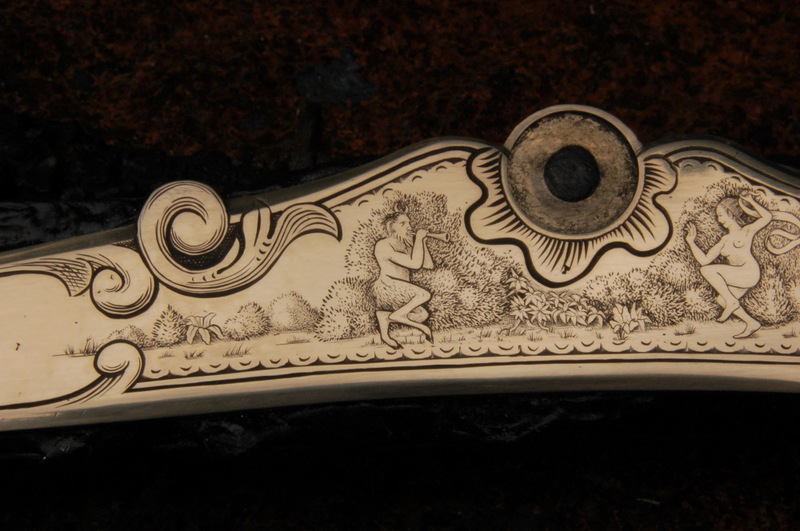 The cheekpiece inlay is complete at the moment, with four more locations for scenery to follow. 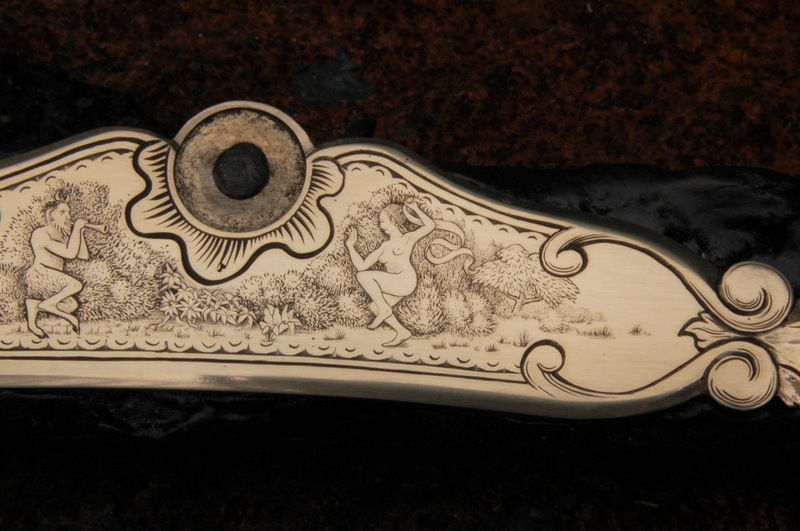 Below is a photo of the completed inlay, ready for installation on the buttstock of the rifle. 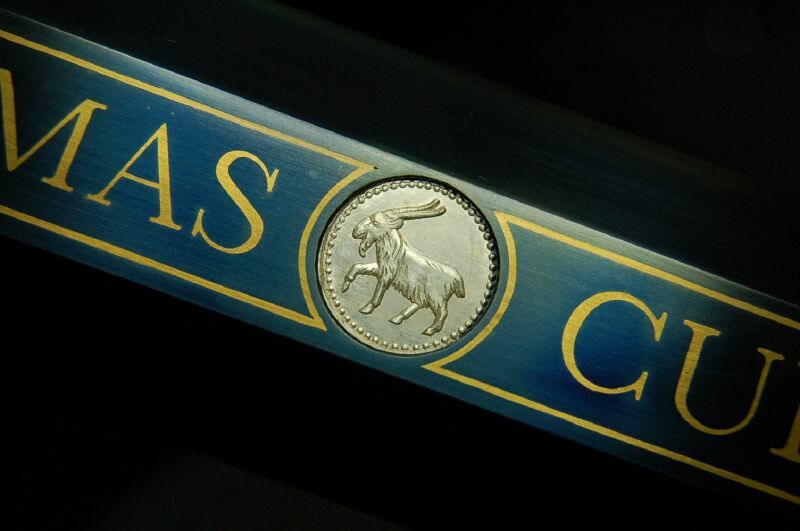 This is cut from sterling silver sheet, curved to fit the shape of the gun, and then engraved. I’d like to show you some of the steps involved in producing this piece.